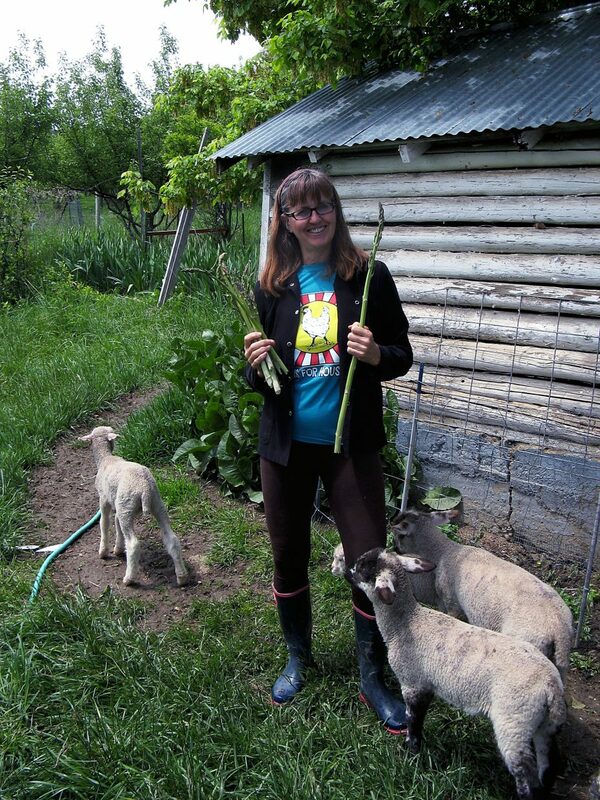 The columnist shows off some of her asparagus find this year. Every year at about this time, an army of scavengers fans out over the landscape, tracing irrigation ditches and fence lines, trailing plastic grocery bags that flap in the breeze. I’ve learned a few things about hunting for asparagus in the last few years, first of all that it’s even possible. I had no idea. As my own interest in local food took root, I began to overhear snatches of conversation about the asparagus hunt. When I asked where and how, people waved vaguely and muttered something about ditch banks. When I asked friends if I could come along to forage, they looked bemused and changed the subject. Favored asparagus hunting grounds are closely guarded secrets not to be shared even among good friends. Asparagus is the first fresh-picked, home-grown vegetable on the calendar. My book on heirloom vegetables pronounces it “the harbinger of summer in any garden, an early and delicious treat after the winter months.” Its season is short and abundant. Asparagus is easier to pick than to grow, because it takes time to establish. Whether planting seeds or roots from the nursery, the gardener must fight the temptation to pick the tasty spears for at least two years while the plant invests its life force into developing long, fleshy roots that penetrate deep into the earth, where they tap into groundwater and reliably produce shoots in April and May even when the soil appears dry. I’ve heard some refer to their spring harvest as “wild asparagus,” but feral is more accurate. It’s an old plant, in every sense. Ancient Egyptians and Syrians knew its delicate flavor. Greeks and Romans ate it fresh in season and dried it for the winter. A recipe appears in the oldest surviving cookbook dating back to the third or fourth century. Always trend-setting gourmets, the French were first to cultivate it in Europe, starting in the 1400s. Like planting a tree, starting your own asparagus crop is an investment in the future. It will produce vegetables for years, nay, decades to come. Plant asparagus when you have your first baby, and he’ll harvest the spears when he visits home after completing his medical residency. This perennial thrives 20 to 30 years or more. Once the roots are established, snapping off the shoots at the ground encourages more production. Unpicked, those tasty tips stretch out and open into feathery fern-like fronds that produce little yellow flowers (male) and red berries (female). Once they’ve achieved their climax of sexual reproduction, they lose all motivation to send up more shoots. Those deep roots throw up stalks that grow like bamboo, so fast you can almost watch it, so it pays to look every few days. Break off the stem and feel water droplets splash away. Asparagus is 93 percent water and doesn’t last long in the refrigerator. It was Ed who finally showed me how to spot asparagus. It grows here and there along the fences around Colby Farm, near the ditch and along the terraces behind the house where grape vines once flourished but have died away. The stout spears knifing skyward above the grass stand out to the trained eye. Last week a little golf cart halted at the side of the road. A small boy perched on the seat while his father scavenged among the roses and the rocks that seem to mark the asparagus. I walked to the edge of the property and poked my head between two lilac bushes. “Um, I really like to pick the asparagus down here,” I said. He stood his ground. “I’m only taking it from the roadside,” he said. To find asparagus, scan the roadsides for tall, fernlike plants with red berries. Last year’s spindly gray skeletons are light and hollow, and mark likely places to find fresh stalks. Or else watch for strangers tramping through rain-soaked fields, wearing galoshes and clutching bulging plastic grocery bags, and follow them.